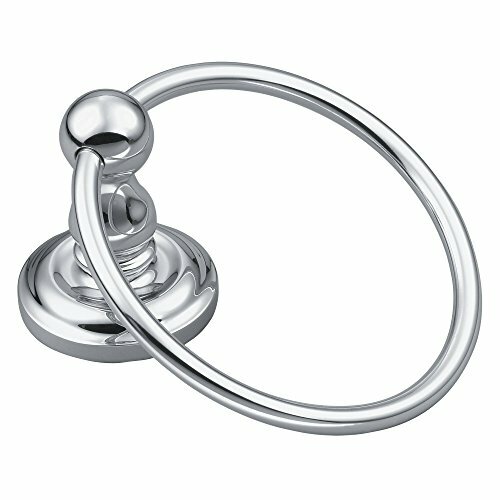 BP6986CH Finish: Chrome Features: -Towel ring. -Create a bright, highly reflective, cool grey metallic look. -Madison collection. -Stamped steel mounting bracket. -Corrosion resistant. -Included template and mounting hardware take the guesswork out of installation. Product Type: -Towel ring. Style: -Traditional. Mount Type: -Wall mount. Primary Material: -Metal. Dimensions: -7.5" H x 6.13" W x 3.5" D, 0.93 lb. Overall Height - Top to Bottom: -7.5". Overall Length - Side to Side: -6.13". Overall Depth - Front to Back: -3.5". Overall Product Weight: -0.93 lbs.